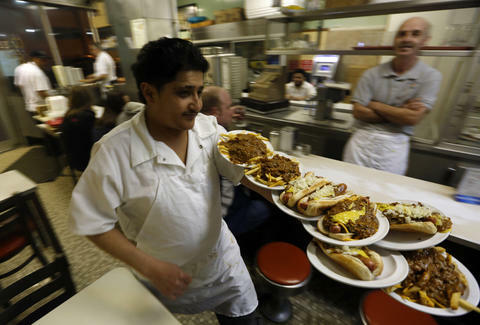 The thing about the Coney dog is that it’s probably the best-loved food in all of Detroit. Yeah, we have square pizza, pierogies, fried chicken, and barbecue that could put up a good fight, but when it comes to something uniquely Detroit, the Coney stands alone. 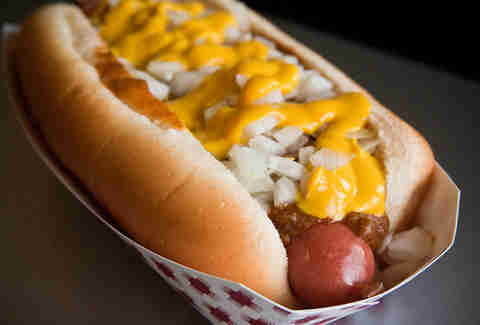 What would Detroit be without the Coney dog? Oh, son, we’d be hot messes. We’re not gonna tell the history of the Coney (its immigrant story and the faux rivalry between the brothers behind Lafayette and American is well-known at this point); instead, we’ve assembled a panel of experts on the subject to tell us exactly what it is that is required to make a proper Coney. "A Detroit Coney is mustard, chili, and onions layered on top of a grilled hotdog in a steamed bun," says Richard Harlan, who co-owns Red Hots Coney Island in Highland Park, has been working in the business since he was 13 years old. "Mustard should always go under the chili. You want to taste the chili with the onions and mustard should only enhance the flavors." Clearly, the proper layering is not something to be taken lightly or altered. Banish all ye who put the mustard on top of the chili. Yes, an important ingredient in a Detroit Coney is Detroit itself. Harlan says Red Hots hasn’t changed its chili recipe since it opened in 1921, and always prides itself in using the freshest ingredients it can find -- the quality of which makes all the difference between what could be a mediocre, dressed-up hot dog and an addictive Coney dog. "All the components of a great Coney dog are fresh," Harlan said, adding that his chili starts with "good ground beef, real onions, and garlic." That consideration goes all the way down to the spices. A finessed chili is what defines Detroit's Coneys, agrees Mike Mouyianis, owner of Zeke’s Rock ‘n’ Roll BBQ and an all-around expert on all-things meat. "It’s different than in other regions, it’s very distinctive," Mouyianis says. "The snap of the natural-cased dog and the zip of the chili and onion make the flavor stand out." At Duly’s Place, a narrow Southwest Detroit diner that’s been spreading the Coney gospel for nearly 100 years, the chili also comes first, but owner Joe Gojcaj acknowledges that there isn't one recipe that dictates the Coney canon. “There are lots of variations out there,” Duly’s says. "For example, our chili has the right amount of thickness, the right amount of juice and the right amount of spice, so that it stands up on the dog, but doesn't overpower it." “We don't try to be what we are not: we serve everyone from the senior executives to priests and rabbis; college kids, factory workers, so-called hipsters, neighborhood residents, teachers,” Gojcaj says. "We are proud that everyone sits at a stool in our place. You rub elbows with whoever you sit next to: there’s no real personal space and you eat quality food at an affordable price." "We are the original fast food." What else sets Detroit’s Coneys apart from the dogs of elsewhere? Harlan says in other towns, they may use a dry sauce, or other toppings such as tomatoes or sauerkraut. Which, gross. “From what my customers tell me, when people hear Coney dog with mustard, chili, and onions, folks automatically know that's a Detroit dog,” he says. Sitting one block away from the now defunct Highland Park Ford Plant, where the moving assembly line was first utilized to build the Model-T, Red Hots perfected its ability to serve up a hot meal to hurried autoworkers. "Those folks would rush from the factory and eat a meal that was made quickly, then back to work," Harlan says. "The blue collar work culture and food culture go hand in hand. Work hard, grab a quick meal, then get back at it. Red Hots was able to do that with a quality product and we still I laugh sometimes when a customer says when they get their food, 'Boy, that was fast.' I tell them we are the original fast food." Megan Frye is a writer based in Detroit and Mexico City. She still finds the suggestive nature of "Serve the Curve" billboards on I-75 to be gloriously entertaining. Tweet her about your favorite type of wiener at @fryechild.